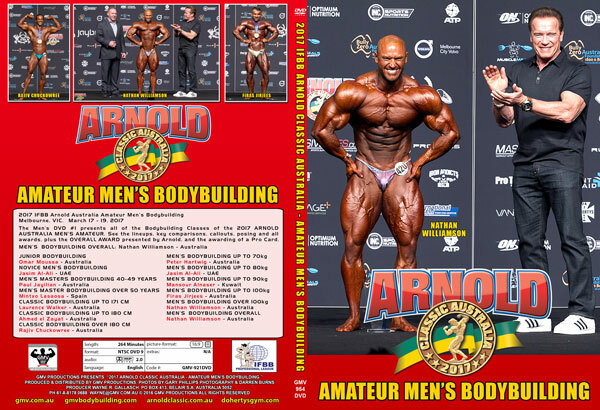 The Men’s DVD #1 presents all of the Bodybuilding Classes of the 2017 ARNOLD AUSTRALIA MEN’S AMATEUR. See all of the Classes of MEN’S PHYSIQUE – Novice and Open, plus the ARNOLD MODEL SEARCH AUSTRALIA – MALE MODELS. Plus the Overall of the Men’s Physique and the awarding of the Pro Card to Florian Wolf. The Arnold Model Search winner was Isaac Lynch.